Drug and Alcohol related problems are responsible for millions of lost work days per year, they are also involved in up to 60% of all fatal work-related accidents. Drug and Alcohol use can create huge challenges not only impacting on the workplace, but communities, families and individuals. These days, employers have to face these challenges every working day – often making difficult decisions that will affect the health and well-being of those in their employment. Drug and Alcohol testing in the workplace can be a daunting prospect for any business – that is why ARC Medical offers simple, accurate and reliable advice to help you implement or maintain your Drug and Alcohol policy. It’s essential that companies have the right Drug and Alcohol policy in place for their business – and that it is communicated effectively throughout the workforce. Employers are breaking the law if they are aware of drug and/or drink-related activities in the workplace and fail to act. They also have a duty of care to protect staff from the mistakes of other employees acting under the influence of Drugs and/or Alcohol. When it comes to applying Drug and Alcohol testing in the workplace, our advisory service offers businesses everything it needs to create a clear policy. The advice provided will guide directors and managers through how to apply a Drug and Alcohol policy effectively across a company’s workforce so that it has maximum benefit. Pre-placement and periodic testing – screening which is designed to work in line with your recruitment process and your on-going workforce health checking requirements. Random and unannounced screening – an easy and fair way to monitor employees for the use of banned substances whilst at work. This is an excellent deterrent for employees in any industry, particularly important if your employees are performing ‘safety critical’ duties in the workplace. or pupils. With instant results, this method can quickly send a very strong message. Emergency or ‘For Cause’ screening – available whatever time of the day or night – 24 hours a day – 365 days a year – Nationwide. Medical Review Officer – Our specialist Medical Review Officers are available to review and interpret positive results, to validate the collected sample procedures are in order, to explore any alternative explanations for a positive result. 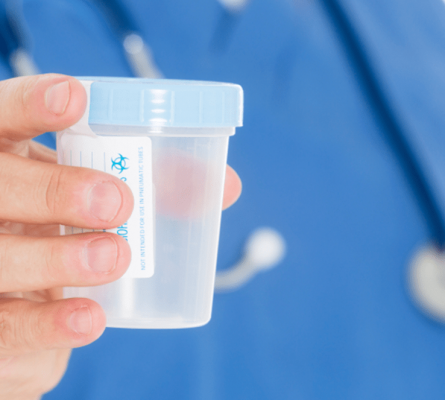 All urine specimens and breath samples are taken by fully trained, experienced Collection Officers under Chain of Custody procedures either at our nationwide medical facilities, on site at a location of your choice or on site using our flexible and convenient mobile service. Our nationwide network of highly trained collection officers is regularly monitored and audited in line with our clinical governance procedures. Our service includes the random selection of staff, professional specimen collection and reporting of results. We are fully RISQS Accredited and able to undertake testing for a whole range of various industries. In addition, we can help you meet your standard requirements for random testing of the workforce. These Drug and Alcohol services are commonly performed alongside other occupational health services, offering a tailor-made service for each client.